How do I find the link to my peer-to-peer fundraising page? Select “Dashboard” in the navigator at the top of your screen to head to your Personal Dashboard. If your Personal Dashboard is not your default dashboard, you can toggle to it from the blue bar at the bottom of your page. Once you've navigated to your Personal Dashboard, click the “Toolkit” button below your Personal Fundraiser. You'll then be directed to your fundraising toolkit where you can customize your page, change your goal, give thanks to donors, and more! 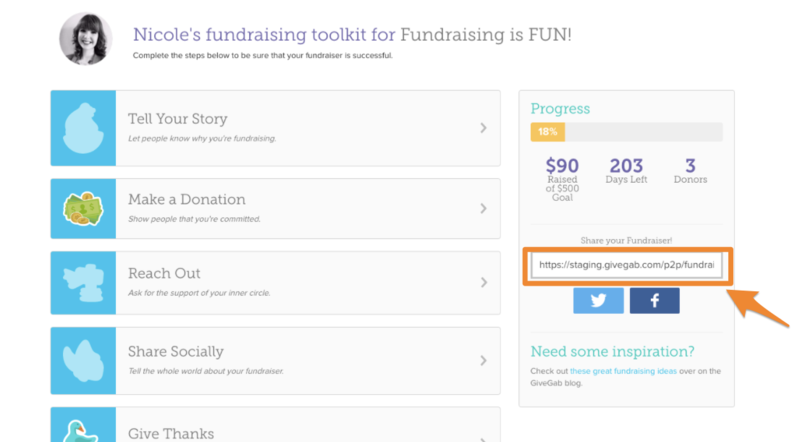 You will find the direct link to your P2P fundraising page within the Progress box on the right side of your fundraising toolkit. Copy the link in that box and share it with your network to spread the word about your P2P fundraiser.